Believe it or not, the business of search engine optimization can be really fun — and funny! With all the analyzing of keywords, numbers and data, and the stress and pressure of getting sites to rank, it’s hard not to take SEO seriously. And trust me, here at SEO Advantage, we take our jobs very seriously. But that doesn’t mean we can’t inject a little humor to SEO every once in a while — a little comic relief to break up some of the (keyword) stuffiness. So we scoured the web to want to share some of the funniest jokes we could find about digital marketing, link building, content marketing and all things SEO. For the most part, these jokes are aimed at our fellow gurus — those of us in the day-to-day trenches of SEO. So whether you need a quick, lighthearted distraction or trying to get through a long week without going insane, we invite you to take a much-needed comedy break and laugh with us below. If you have more SEO-related jokes, please share them in the comments below. Obligatory disclaimer: The jokes below are sourced from different websites and curated into this post. All credit goes to the joke creators. Also, the message of these jokes don’t necessarily reflect the views and opinions of our company. They’re just supposed to be, well… funny. Why did Tiger Woods start studying SEO? To get his #1 ranking back. Why did the SEO expert cross the road? To get hit with traffic. How did the SEO find her way back through the woods? Bread crumbs. What do you call the number of times an SEO expert can jump on a trampoline? Their bounce rate. What is a black hat SEO’s favorite Thanksgiving food? Spam and keyword stuffing. Why did the SEO expert get kicked out of the grocery store? Cutting in line to be 1st position. How does Google decide who to hit hardest with Penguin updates? Flipper coin. What do you get if you cross a Penguin and a Panda? A ranking problem. Why is it wrong to have lots of Pandas in the same cage at the zoo? It could be considered stuffing. Why have so many people unfollowed Google Panda on Twitter? Because they post too many updates. What does an SEO and part-time chiropractor fix? Backlinks. I just got back from an SEO convention. Was given room 404 in the hotel I stayed at, but I couldn’t find it anywhere! What’s an SEO’s favorite music? Heavy meta and ALT+ernative. Why did the Penguin attack the leopard? Because he thought it was the lynx. Why do they call it the “mini-Panda” update? Because it finds content that is a little bare. What do SEOs use when they go fishing? Linkbait. What does the SEO use besides consonants? Disavowals. What two things do SEO’s bring for lunch? Cookies and link juice boxes. Why do SEOs hate watery oatmeal? Thin content. Why do SEOs love the farmers market? Lots of organic content. Why do SEOs love monkeys? They have long tails. What does an SEO call three bottles of microbrew? A local 3-pack. Why are SEOs good at game shows? They know how to get Quick Answers. How do the SEOs increase the chances their rock band will be discovered? By turning up the AMP. What does an SEO have for breakfast? Spam and java. What does “spam” stand for? Sites Positioned Above Mine. What do you call a man with six fingers on one hand? Supplemental index. What’s the difference between an SEO consultant and a used car salesman? The used car salesman knows when he is lying. An SEO couple had twins. For the first time they were happy about duplicate content. Why don’t SEOs ever play golf? They fear the sandbox. Here at SEO Advantage, our search engine optimization services are no joke! Contact us for help supercharging your website so that it works not just harder, but smarter. Which joke is your favorite? Cast your vote on Facebook or in the comments below. 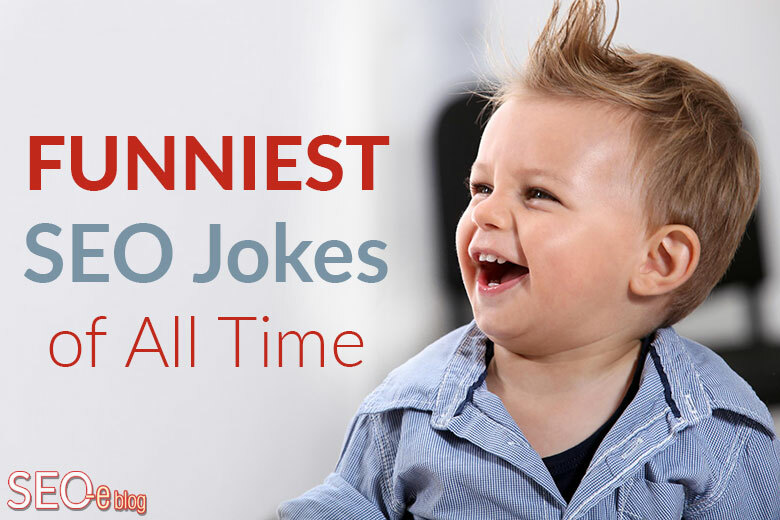 Also, feel free to share your favorite SEO-related joke!